If you have encountered a preacher who is frank and straightforward, unafraid to dispute other doctrines he knows are wrong, and whose knowledge about the Bible is irrefutable – then you must have seen or heard of Brother Eliseo F. Soriano. With these characteristics, Bro Eli has become well-known as the host of the popular religious television program, Ang Dating Daan (The Old Path) and the Overall Servant of the Members Church of God International (MCGI). At 71, Bro. Eli Soriano relentlessly continues the efforts he began since his teenage years of propagating the Gospel of Christ to the whole world. In celebration of his 54th year in service to God, take a glimpse at his humble roots and his enduring journey as an international televangelist unlike any other. Bro. Eli began his ministerial works at the tender age of 17. Since then, he has become a well-known international televangelist, host of the longest running religious television program Ang Dating Daan (The Old Path), and Overall Servant of Members Church of God International (MCGI). The late Brother Carlos G. Buan, a Church member for over 45 years, shared how he witnessed Bro. Eli’s early years of preaching. The beginning of which can be traced back on April 7, 1964 when he was baptized in the Iglesia ng Dios kay Kristo Hesus, Haligi at Suhay ng Katotohanan (Church of God in Christ Jesus, Pillar and Support of the Truth) headed by Bro. Nicolas Perez, who served as Bro. Eli’s mentor. Not known to many, Bro. Eli grew up as a very timid boy who was reluctant to be in front of many people. No one would have thought he would become someone who will preach and speak before a crowd, but it was his calling. He was then 17 years old. Instead of finishing high school, Bro Eli focused on studying the Bible and attending the Church’s ministerial classes. With the help and guidance of God, he became a minister of Christ and started conducting Bible Studies in the province of Pampanga, as well as having debates against pastors from other religious denominations, as sent and ordered by Bro. Nicolas Perez. When Bro Nicolas Perez died in 1975, Levita Gugulan, the Church’s general secretary, was appointed as the temporary leader. Bro. Eli then denounced her headship saying that women are not allowed to be leaders of the church according to the Bible. Bro. Eli, alongside his allies, left Gugulan’s sect in 1976, and registered a new group to the Philippine Securities and Exchange Commission the following year. 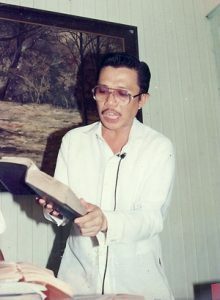 The group was called Mga Kaanib sa Iglesia ng Dios kay Kristo Hesus, Haligi at Saligan ng Katotohanan sa Bansang Pilipinas, Inc. (Members of the Church of God in Christ Jesus, Pillar and Ground of Truth, Philippines, Inc.), which was now renamed and re-registered as the Members Church of God International in line with the growing number of members in other countries, both Filipinos and non-Filipinos. So in 1980, Bro. Eli started a radio program he called Ang Dating Daan wherein he discusses various religious topics using the Bible as his basis. The program, which celebrated its 37th anniversary in December 2017, is now hailed as the longest running religious television program. With merely a three-man production team – composed of himself; Bro Daniel Razon, his nephew and currently the Assistant Overall Servant of MCGI; and Sister Luz Cruz – Ang Dating Daan was first heard on DWWA 1206 kHz. Several other local radio stations in the country aired the program such as DWAR, DZME, DZMB, DWAD, DZRD, DWAN, and DZXQ. Bro. Eli soon conquered broadcast through television when Ang Dating Daan was aired on IBC-13 in 1983. In the following years, to cater to more viewers, the program featured various segments, such as Itanong mo kay Soriano (Ask Soriano, the Bible Will Answer), Truth in Focus, Biblically Speaking, How Authentic the Bible is, and Bible Guide. In 1993, Itanong mo kay Soriano was launched as a separate TV show. Prior to this, the segment would usually take place right after the airing of Ang Dating Daan. The former has become popular to many as it is an avenue for people to ask Bro. Eli anything about religion and spirituality, and on the spot, he answers using verses from the Bible. In 2004, Ang Dating Daan and Itanong Mo Kay Soriano, along with the other programs of Bro Eli found a permanent, new home when they moved to UNTV 37. Previously, Bro Eli’s programs experienced several transfers from one local TV station to another due to different issues, most of which were spurred by his rivals in other religious groups. Embarking on television and radio to broadcast the truth has led thousands of people around the world to hear Bro. Eli’s preachings. Currently, the Church holds regular indoctrination and baptism sessions in the Philippines and in other countries to accommodate people who are enlightened, with God’s help. “I’ve been investigating Ang Dating Daan for four years, not only on TV but also on the Internet. I watched it all, including Bro. Eli’s debates. I like them all as I learned the truth from the Bible,” shared Brother Rainard Beroin when he was newly baptized into the Church back in 2013. Bro Eli Soriano has received various awards and recognitions for over the years of his worldwide propagation efforts. Over the years of Bro Eli’s relentless preaching, he has received numerous awards and has been recognized by different award-giving bodies. Among the early accolades of Bro. Eli was the “Most Outstanding Minister” award given in 1983 from the DZBB radio program, Dis is Manolo and his GENIUS (GENIUS stands for God Eternal News In Universal Salvation) Family. This program of veteran Filipino radio broadcaster Manolo Favis featured religious discussions among a panel comprised of preachers from different religious denominations. Bro. Eli earned the same award in the following year, and no other minister was given that award after him. In 1998, Concerned Media, Inc. bestowed upon Bro. Eli the Golden Leadership National Award in “full recognition of his exemplary leadership sealed with honesty, industry, and dignity, which have established his personality among peer and to the highest of ministerial services.” In the same year, the Philippines’ National Biographic and Historical Research gave him the Freedom Award for Bro. Eli’s truthful broadcast of the words of God. The esteemed Dangal ng Bayan Awards of the Civil Service Commission has also recognized Bro. Eli for his tireless propagation efforts. In 2014, Bro. Eli received the “Best Bible-Based TV/Radio Evangelist” award, while in 2015, he earned the “Outstanding Global Evangelist” from the said award-giving body. Through the years, Bro. Eli earnestly continued the radio and television broadcast of his programs with the purpose of propagating the Gospel of Christ written in the Holy Scriptures. 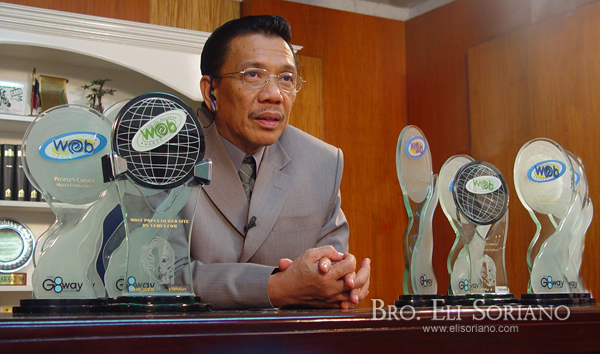 In 2005, when Bro Eli was obliged to leave the country due to the persecution of his opponents from other religious organizations, he took the God-given opportunity to extend his broadcast and propagation to other parts of the globe. In his worldwide endeavor, he mirrored the efforts he began in the Philippines to different countries in Asia, Africa, Europe, and South America. Bro. Eli’s primary means of preaching was Worldwide Bible Expositions wherein the format of Itanong Mo Kay Soriano was incorporated. Soon enough, Bro Eli settled in Brazil, South America and focused the evangelization there and nearby places, in fulfilment of the prophecy written in the Bible (Malachi 1:11). He then brought Ang Dating Daan (translated as The Old Path in English, El Camino Antiguo in Spanish, and O Caminho Antigo in Portuguese) to international television airwaves. In 2009, the Church launched its own broadcast channel, TV Verdade, in South American Countries, marking the beginning of the 24-hour broadcast of the flagship program. Bro. Eli has also come to learn to speak Spanish and Portuguese to better preach in the Western nations. Bible Expositions are personally conducted by Bro. Eli in various regions in Latin America such as Curitiba, Lages, and Florianopolis in an almost daily basis. “I felt a different kind of joy when I went to Brazil, especially when I saw Bro. Eli and the Church members who are from different races. I felt that we all shared the same faith despite our differences in skin color and in language,” Sis Susan Reyes, a Nueva Ecija-grown Church member for more than 15 years now, recounted her experience during her visit to Brazil, where she was able to attend Bible Expositions hosted by Bro Eli. With the help and mercy of the Almighty, Bro. Eli’s propagation efforts are non-stop. In the Philippines, his programs are being broadcast on radio through UNTV Radio La Verdad 1350 kHZ (with live streaming via UNTV Radio Website). Click here for the complete list of schedule. Meanwhile, on television, Bro. Eli’s programs are aired through UNTV 37 in the Philippines with live streaming via UNTV’s website. Here is a list of the schedules. For worldwide broadcast listing, click here for the regions covered and their respective broadcast schedules.